The Bulls Monday were preparing to play the NBA best Milwaukee Bucks — I know, when did we ever read or hear that sentence before? — and perhaps the league’s Most Valuable Player this season, Giannis Antetokounmpo. Lauri Markkanen was going to draw the unenviable defensive assignment against the NBA’s Mr. Fantastic, who like the Fantastic Four movie character seemingly can twist, stretch and reshape his body into other worldly forms. So the Bulls’ own seven-foot marvel before the game said he took a look at the history of the once shy European who averaged a negligible 6.8 points as a 19-year-old rookie, Markkanen’s age when he joined the Bulls. Antetokounmpo crept up to 12.7 per game the next season, culminating in the frustration of a playoff suspension when he could not handle the Bulls Mike Dunleavy, and then averaging 16.9 points his third season. It wasn’t until the so-called Greek Freak was working on 23 and 24 years old before he began to break through with scoring averages of 22.9 points and 26.9 points. The Bulls versatile seven footer didn’t make any predictions. But he didn’t back down Monday, just as he wouldn’t even as the Bulls trailed by three points with under three minutes left, but again couldn’t close and lost 112-99 to Milwaukee. “Just preparing this game, I kind of looked through his career and he’s improved every year,” noted Markkanen, who had his seventh double-double in the last eight games with 20 points and 17 rebounds. Markkanen, seemingly finally recovered from that early season elbow injury, is averaging 26.2 points and 13 rebounds the last five games, and 21.5 points and 11.8 rebounds over a 13-game stretch back to mid January. He got support Monday from Zach LaVine with 27 points, seven assists and five rebounds and newcomer Otto Porter Jr. with 18 points, seven rebounds and four assists. Antetokounmpo, however, was dynamic and overwhelming with 29 points, 17 rebounds and eight assists in leading the surprising Bucks. But he wasn’t at Markkanen’s level of play fewer than two seasons into his career. Greek Freak? Do the Bulls have a Fabulous Finn? Finnish Freak? Hey, you don’t find many seven footers with that kind of shooting touch, determination on the boards and ability to carry the ball full court. Now, that’s freaky. Markkanen smiled, but even if the Bulls couldn’t about an 11th consecutive home loss and the record falling to 13-44, Markkanen’s continuing improvement in even this truncated second season provides some brightness through the gloom of this lost season. Especially with the continued scoring of LaVine despite dragging to the All-Star break this weekend on gimpy ankles and a thigh injury and Porter providing a consistent third offensive option. “Otto doesn’t even know any of the plays,” laughed LaVine. “He has been playing four and five, so he’s been doing great. Put him in pick and roll and he took over part of the game, facilitating and making shots. He’s a lot more than a catch and shoot guy. Otto has definitely been giving us space. Before, they were loading up on the elbow. So it was hard for me to drive the seam. I can get to the paint and I can create for myself or others. I feel his role is going to be a lot bigger than it was in Washington; his game is better that that. It just isn’t translating to wins for the Bulls quite yet, and no one is suggesting Markkanen should be the league MVP some day. But Antetokounmpo’s Bucks averaged fewer than 30 wins his first three seasons and 35 wins through his first five. Stardom most often comes to a slow boil, and like that watched pot, it seems never to boil. Until it does. “I thought the first half we controlled the game a little bit,” said Bulls coach Jim Boylen, the Bucks with a 50-49 halftime lead. “Got down (12 in the third quarter and cut to one, 14 with five minutes left and trimmed to three). We battled back. I thought our guys played well. Give them credit. [Eric] Bledsoe makes the three when we’re down three and we just couldn’t get it back from there. I burned my timeouts because I thought we just had to keep the game close and under control. I thought we had some great looks that didn’t go down. That happens, but I thought we played hard. Obviously, our bench is a work in progress. We have to get more from our bench. I thought Lauri matched (Antetokounmpo) force for force. Lauri is a tough kid, he is not scared of anybody. As a matter of fact he asked me, said ‘I got him, right, I got him?’"
“I said it after last game. I always like to compete against the best,” said Markkanen. So the Bulls have to just smile, sigh and move on, one more game, at home Wednesday against Joakim Noah and the Memphis Grizzlies, before a week off for the annual NBA All-Star weekend. Markkanen is the only member of the Bulls family going this season, playing in the Friday Rising Stars game for a second time. Next year, the All-Star game will return to Chicago for the first time since 1988 and perhaps there will be more Bulls representation. They are starting to show some life and competitiveness even if it’s not producing net results in the standings. “Seems like it’s that broken record every game,” said LaVine, shooting 55 percent in five games this month and 43 percent on threes with four of six against the Bucks. If anything, he needs to take double the amount of threes he attempts every game as the Bulls once again were outscored on threes. Again, it equalled just about the difference in points. The Bulls spend too much time driving the ball without results, which is the fate of teams with losing records. The pivotal sequence at the end of the game was a familiar example. Bledsoe dropped in that clutch three with 2:37 left for a 103-97 Bucks lead. LaVine then drove and was battered going up. No call, and the Bucks continued on a 10-0 run to close out the game. Bledsoe made that three with Kris Dunn laying off a bit too much, the Bulls perimeter defenders told to go under screens (Dunn took a hard fall on his back, but said he should be OK for Wednesday). Though there wasn’t a screen on that play, Dunn was shading to help on Antetokounmpo and laying back in the lane. The theory about going under screens is to avoid the mismatch with a big man roll player like Antetokounmpo. Other teams do that, though the Bucks are a dynamic three-point shooting team and made five fourth quarter threes to burn the Bulls. Milwaukee is 42-14. LaVine made his share of tough shots and drives. Markkanen took the challenge of Antetokounmpo and went back strong at him, a late second quarter Markkanen run getting the Bulls within one at halftime. 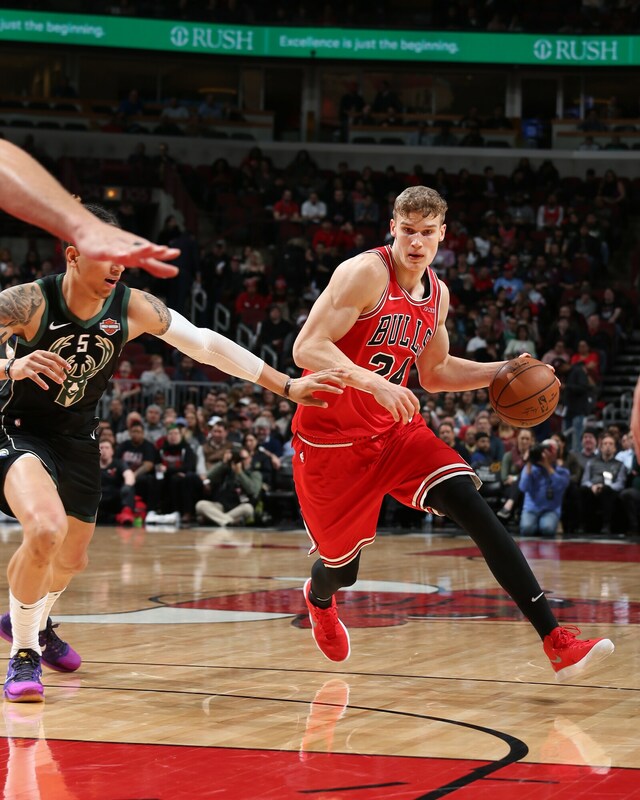 The Bulls third quarter start was shaky, but they recovered with LaVine bailing out Markkanen on a possession Markkanen was blocked twice with a rebound and driving score and Porter with a tough pullup three to get the Bulls within 69-67 late in the third after the Bulls trailed 65-53. 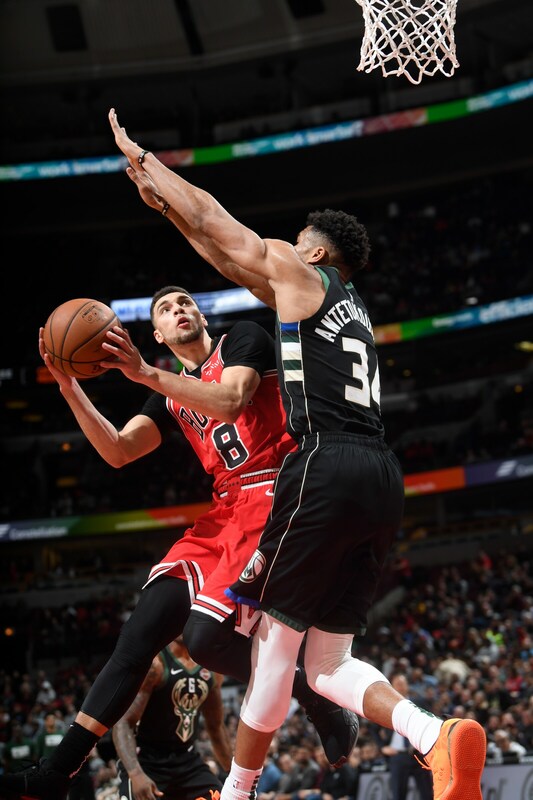 It was 79-71 Milwaukee after three and a tough start to the fourth from the reserves before an 11-0 Bulls run with a LaVine three, a Markkanen roll for a score on a nifty LaVine pass, Robin Lopez with a jumper and a baby hook and Markkanen banging his way to the free throw line. But once again there was no finishing kick. Or even a Finnisher’s kick. But perhaps one day.